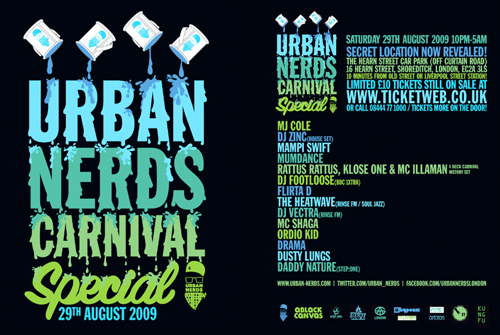 In our little rundown of must-attend events for this year´s Notting Hill Carnival weekend, we already mentioned the Urban Nerds´ Carnival warm up Special on Saturday, August 29th. With DJ Zinc, MJ Cole, Mampi Swift, DJ Footloose (BBC 1XTRA), DJ Vectra (Rinse FM), Flirta D, Mumdance, Rattus Rattus, Klose One & MC Illaman, The Heatwave (Rinse FM) and more on the bill, the line up really is massive. Note: Limited £10 advance tickets are still available but will sell out. Tickets will also be on sale on the door for more – first come, first served. Have u seen carnival microsite from this year sponsors of CMC/Matrix stage? Have a look at winkball.com/nottinghillcarnival They have some footage from previous years as well as this year coverage.